Jezzies! 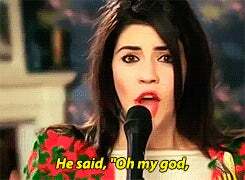 I'm seeing Marina and the Diamonds for the first time tomorrow and I'm spazzing like a teenager. I haven't been this excited for a live show since... like... Tori Amos circa 1998. Eeee! So any other Marina fans? Alt. BONUS question — best concert you've been to?